This is a record company NOT a label. Please use the branded label, usually Parlophone, His Master's Voice, Odeon or EMI. This company may be entered with its correct company role only. The Gramophone Company Of India Limited is an Indian record company established 1901 and originally part of the EMI group. The company was initially incorporated in August 1946 with the name of “The Gramophone Co. (India) Limited”. Later the name of the Company changed to “The Gramophone Co. of India Limited” and with effect from April 1956 the word “Private” was added to its name. It was converted into a public company in October 1968 and consequently the name of the company was changed to “The Gramophone Company of India Limited”. In 1985 ownership of the company was passed to the RPG Group and eventually renamed to SaReGaMa India Ltd. in November 2000. In 2005, the last 8% of the remaining stake of EMI were sold, making the company completely unrelated to EMI. The record company is presently active under the name SaReGaMa. 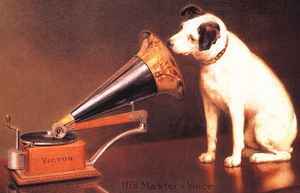 The company used the His Master's Voice "Nipper" logo, a registered trademark of "The Gramophone Company, Ltd."
From 1928 onwards the company also operated a record, cassette and CD manufacturing plant, located in Dum Dum, near Kolkata (formerly Calcutta).